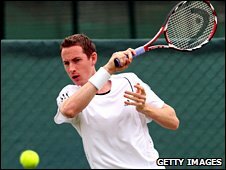 A tennis watchdog has been alerted after unusual betting patterns around a victory in the United States for British number 12 Richard Bloomfield. More than £1m was staked with online firm Betfair on Tuesday's Hall of Fame Championships match where Bloomfield beat Christophe Rochus. The world number 552 defeated 160-ranked Belgian Rochus 7-6 (7-1) 6-3. The BBC understands Betfair contacted the Tennis Integrity Unit (TIU) over the match at Newport, Rhode Island. Despite the first-round match being a relatively obscure event, Norfolk-based Bloomfield was backed from evens to 1-4 in the hours leading up to the grass-court encounter. After he won the first set, the odds on a Bloomfield victory shortened further to 1-8, so £1 was won for every £8 staked. Betfair has a memorandum of understanding with the International Tennis Federation where it works in partnership to counter any corruption issues in the sport. It is understood the firm has alerted the TIU, which is an independent body created by tennis governing bodies to fight corruption. Spokesman Tony Calvin said: "There was more interest than would normally be the case in a match of that nature. "People were talking about a gamble prior to the match on forums and there may have been the element of a bandwagon effect." Bloomfield, 27, has gone on to reach the semi-finals of the tournament. He beat second seed and world number 56 Santiago Giraldo 6-3 7-6 (7-5) then inflicted a 7-5 6-7 5-7 quarter-final defeat on Ryan Harrison. A TIU spokesman said it would not comment on whether any investigation was taking place. "The Tennis Integrity Unit works closely and co-operatively with the betting industry to monitor betting patterns on tennis matches around the world," he said. "As an operational policy the unit does not comment on any investigation that it may or may not be involved in." There is no indication as to whether the TIU is likely to launch an investigation into the Bloomfield-Rochus match. Additional reporting by Chris Summers.